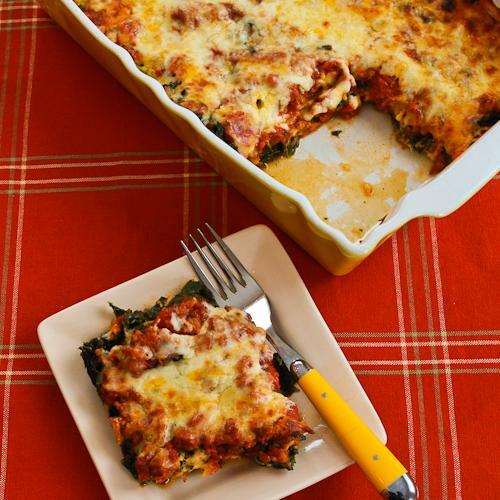 This Sausage and Kale Mock Lasagna is so delicious, you won't even miss the noodles! I love creating Phase One recipe ideas beyond the usual grilled-meat-and-salad meals that many people rely on when they're watching their weight. Not that I don't enjoy a delicious piece of meat or fish and a tasty green salad, but after a few days of that I start to crave something that's more in the "comfort food" category. I had comfort food in mind when I came up with the idea for Ham and Cauliflower Casserole au Gratin, and this Sausage and Kale Mock Lasagna is another comforting casserole that's so loaded with flavor that you won't even miss the lasagna noodles. When I made this I ate it for lunch and dinner two days in a row, and if I hadn't put some in the freezer, I might have had it the next day as well! If you're not a fan of kale yet, other sturdy greens like chard or collards would probably work, but I don't think softer greens like spinach would hold up that well in this.